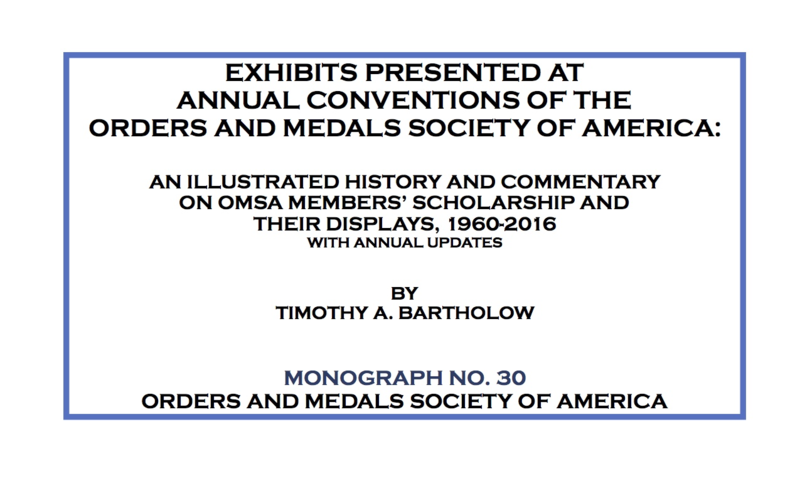 This e-monograph was created to preserve the history of OMSA exhibitors and their exhibits, as presented at the Society’s annual conventions, beginning in 1961. Its overall structure is based on the geographical location of the subject matter, with chapters for major common areas of focus, such as the United States, British Empire, Germany, other European countries, etc. Individual exhibits in each chapter appear based on the level of adjudged award it received. There is also a chapter on the history of the exhibit standards and judging as well as one of analysis and commentary on some of the efforts. The bulk of the monograph, however, is dedicated to the photographic archive of the exhibits. So much of the excellent work of our members on these exhibits has been seen once and then lost to us for further review. In some cases, the exhibitors and their chosen topics at a few conventions still remain unknown, and the search for that lost information continues. A special effort has been made here to include a list of exhibits that did not receive an award, and to present photographs of those exhibits. Those were rarely listed in the convention follow-up articles, so they were perhaps the most transitory of all. This monograph is designed to be updated annually with added pages containing the results of each convention’s exhibits, and, of course, with any new information or new photographs that the membership can provide, as they become available. Because photographs require a great deal of storage space, the overall document has been reduced in size here to be more accessible. If any member desires a hi-resolution copy of any of the color photographs included, they are available electronically on request from the author at (click here). Click here to download the e-monograph.